Much like his restaurants, Roberta’s and Blanca, which made Brooklyn’s otherwise quiet neighborhood of Bushwick a culinary destination, Carlo Mirarchi’s cooking teeters between the simple and the sophisticated, totters from the rough to the refined. The third chef to cook at this year’s Twelve Days of Christmas at The Restaurant at Meadowood, Mirarchi brought his highly expressive culinary voice to Meadowood Napa Valley last night, paired with brothers Adam and Andrew Mariani’s equally expressive wines of Scribe Winery. Mirarchi’s started the dinner with a light and delicate touch: silky charred tomatillo and tender ground cherries (gooseberries) served in pear broth, followed by a sliver of super-tender abalone perched on creamy sea urchin roe surrounded by a frothy surf of yogurt. 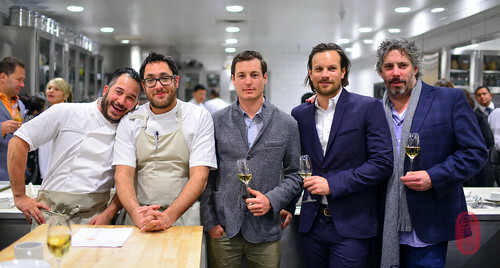 For the centerpiece of this dinner, Mirarchi presented a gorgeous steak, musty with 100 days of dry-aging, garnished with the bitter, charred hearts of puntarelle. Alongside the ruby red strips of meat arrived a plate of bones clinging to pockets of rosy, untrimmed meat. Mirarchi transitioned us from cheese to dessert with a smoked ricotta ice cream, which he served with toasted pine nuts, the richness of which he thinned with a tart wedge of lime. One of the most impressive things Mirarchi brought with him to Meadowood Napa Valley was a collection of charcuterie that he makes with his father. Together, they cure and hang the meat in his father’s basement. There was fantastic, waxy pancetta that was much more lardo than anything, bright pink ribbons of salty prosciutto, and coppa – those swirls of fat and meat from between the piggy’s noggin and shoulder. This charcuterie board was served as a canapé. Last night’s dinner produced some of the most delicious dishes that I’ve seen come out of The Restaurant at Meadowood’s kitchen. When I mentioned this to Kostow, he seemed pleasantly surprised – all of these dishes were completely new, created specifically for the Mirarchi dinner. Among my favorite Kostow dishes from this dinner was a beautifully glazed fist of cod, shiny with a chicken jus reduction slightly sweetened with maple syrup. 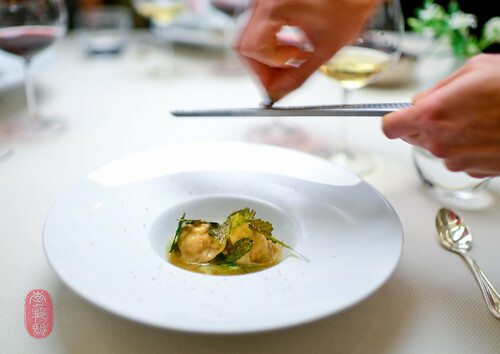 There was also a ravioli pasta made with rye, filled with a rabbit mousse, and served with a warm rabbit broth finished with droplets of caraway oil, which helped highlight the rye flavor in the pasta dough. And the cheese course was incredibly inventive and beautiful as well: nuggets of Mimolette coated in charred quince powder. I had wondered why they were using such young Mimolette when I watched them prep this dish during the day, but it became obvious when I saw what they did with it. A couple of courses before they were served, the nuggets were steamed to soften the inside, and let to sit and temper slightly. The texture of the cheese, when it arrived at the table, was perfect: a slightly warm taffy, served with wedges of quince that had been poached in bell pepper spiked with habanero chili peppers. Both the use of caraway oil (to heighten the rye flavor of the pasta), and the bell pepper water (to intensify the pepper flavor of the habanero without intensifying the spiciness) were brilliant examples of how one ingredient could be used to not only intensify the flavor of a different ingredient, but make that other ingredient taste more like that ingredient. Finding overlap; borrowing flavor – that’s thoughtful, intelligent cooking. 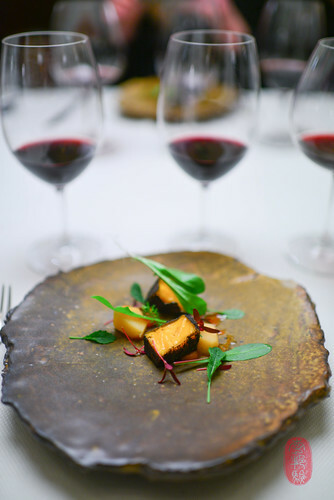 The entire menu from Carlo Mirarchi’s dinner, with wine pairings by the guest vintner Scribe Winery, is below, along with a slideshow from the third day of Christmas at The Restaurant at Meadowood. If you would like to see the photos in a larger size, click through the slideshow to the Flickr album. Aji bone chips, lovage, chard. Rabbit, dried leaves, cured heart. 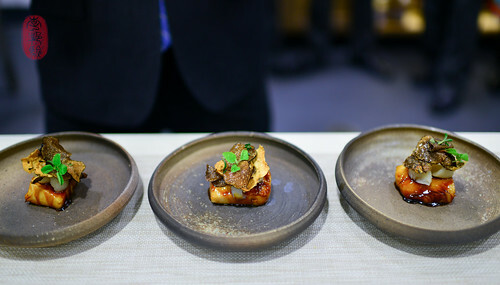 Photos: Maple-glazed cod with sunchoke and black truffle; Carlo Mirarchi, Christopher Kostow, Adam and Andrew Mariani, and Richard Reddington; grating cured rabbit heart over rye pasta with rabbit farce; young Mimolette coated in charred quince powder, with quince poached in habanero. ~ by ulterior epicure on December 11, 2013.